Version intégrale d'un article paru dans Cerveau & Psycho n°100, Juin 2018. Dutton, E., van der Linden, D. & Lynn, R. The negative Flynn Effect: A systematic literature review. Intelligence 59, 163–169 (2016). Flynn, J. R. & Shayer, M. IQ decline and Piaget: Does the rot start at the top? Intelligence 66, 112–121 (2018). Pietschnig, J. & Voracek, M. One Century of Global IQ Gains: A Formal Meta-Analysis of the Flynn Effect (1909–2013). Perspect. Psychol. Sci. 10, 282–306 (2015). Dutton, E. & Lynn, R. A negative Flynn Effect in France, 1999 to 2008–9. Intelligence 51, 67–70 (2015). Weiss, L. G., Gregoire, J. & Zhu, J. Flaws in Flynn Effect Research With the Wechsler Scales. J. Psychoeduc. Assess. 34, 411–420 (2016). NCD Risk Factor Collaboration (NCD-RisC). A century of trends in adult human height. eLife 5, e13410 (2016). Marck, A. et al. Are We Reaching the Limits of Homo sapiens? Front. Physiol. 8, (2017). Williams, R. L. Overview of the Flynn effect. Intelligence 41, 753–764 (2013). Trahan, L. H., Stuebing, K. K., Fletcher, J. M. & Hiscock, M. The Flynn effect: a meta-analysis. Psychol. Bull. 140, 1332–1360 (2014). What you can do to boost your kids' IQ: (1) Have kids with someone with a high IQ. (2) Don't starve them or hit them on head. https://www.sciencedirect.com/science/a … 9614000889 … That's about it at this stage. 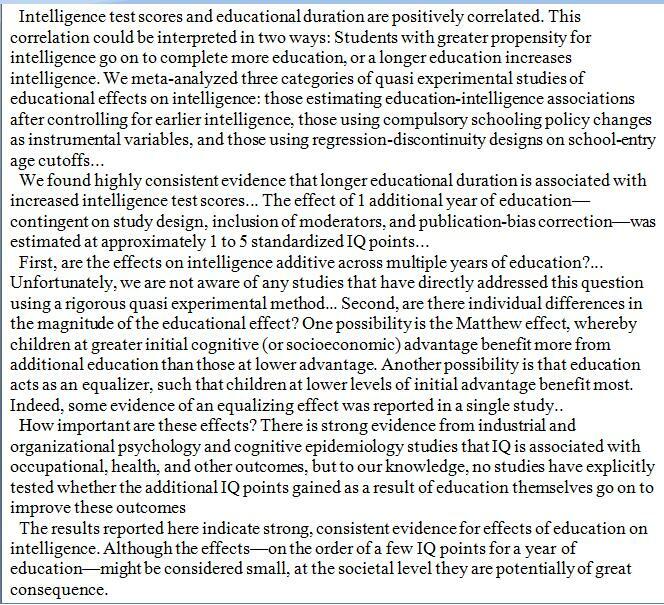 Meta-analysis: Increasing the length of education raises intelligence. The IQ threshold hypothesis - the idea that, after IQ 120, additional IQ points don't translate into higher achievement - is false. 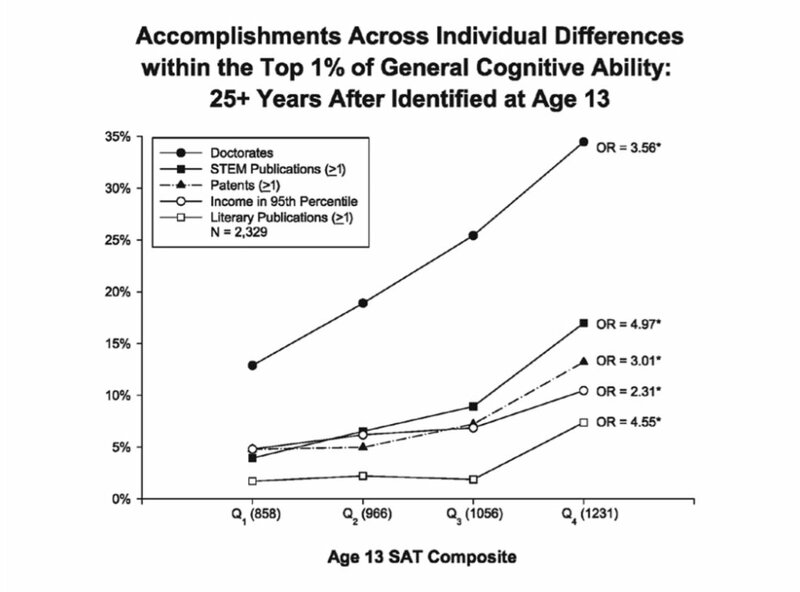 Even among the top 1% (roughly IQ 137+), higher IQ predicts greater achievement.